Flavien Menu presented his two years research project New Commons for Europe at Harvard Kennedy School. Guests include Artur Mas - former President of Catalonia - Gerardo Pisarello - Deputy Mayor, City of Barcelona - Caroline Vicini -EU ambassador to USA. 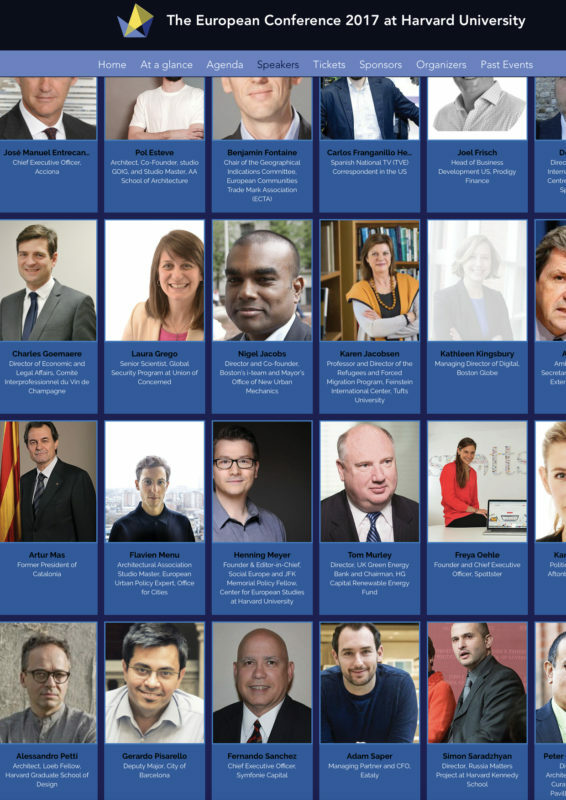 The European Conference 2017 is the fifth edition of an event dedicated to Europe. It is presented by students at Harvard Kennedy School, Harvard Business School, Harvard Law School, Harvard Graduate School of Design and the Fletcher School of Law and Diplomacy. The aims of the European Conference 2017 are to forge innovative, potentially disruptive solutions to Europe’s greatest challenges and propose ideas for bold leadership directly to the current and future leaders of Europe. Flavien Menu presented his two years research about Europe at the Harvard Kennedy School European Conference 2017. In a front of a panel of worldwide policy-makers, Flavien approach has suscited a large amount of reactions: how could we learn form bottom-up actions to shape more accurate policies? How engagement with the civil society could help to create better neighbourhood and social value that escape from most of the top-down decisions? How to survey the impact of public policies on territories and societies? Idea How to Invent New Public Forms ?